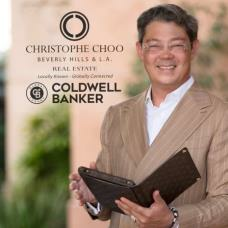 Christophe Choo is an award-winning, top-producing luxury real estate broker with over 24 years of experience serving Los Angeles’ most elite Westside neighborhoods. He is known for his charisma and cosmopolitan flair, but is best known for breaking sales records in the most prominent Westside locations from Beverly Hills to Malibu. A passionate, aggressive and innovative real estate professional, Christophe has earned a position among the nation’s top 100 real estate agents with more than 500 closed real estate transactions over the course of his career. For many years, Christophe has enjoyed “top producer” status in the elite Coldwell Banker Previews® International Presidents Premiere, which honors the top 1% of Coldwell Banker agents worldwide. His non-traditional sales and marketing techniques, combined with in-depth knowledge of the marketplace have consistently positioned him among the top agents in his office and in the top 24 agents for Coldwell Banker Residential Brokerage in Greater Los Angeles for as well as in the Top 250 Teams nationwide in 2010 & 2011according to the Wall Street Journal. His clients—which span from foreign investors and business executives to celebrities and high net worth individuals—continually seek him and his full-service real estate team at the Christophe Choo Real Estate Group to buy and sell luxury estates, single-family residences, high-end condominiums and income properties in L.A.’s most sought-after neighborhoods. Valued as much for his long history of success as for his luxury market expertise, Christophe is a frequent guest speaker at organizations and events such as the Asian American Real Estate Association, the Associated Realty of the Americas, Coldwell Banker International Conference, Generation Blue Conference for Coldwell Banker and Your Coach Conferences with Tom Ferry. He is a regular cast member on the hit HGTV show Selling LA and he has also appeared on several national television shows, including Bravo’s “Million Dollar Listing,” “Beautiful Homes & Great Estates,” “Selling LA”, “Luxury Lifestyles TV”, “LX Open House” “Behind the Gates” and “The T.O. Show” on VH1. Maison 808 8 bedroom 15 bathrooms 26,800 square foot main residence Two guest houses totaling 4,500 sq. ft. 1.68 acres 73,077 square feet - two combined lots APN: 4341-027-020 Revel in European opulence on nearly 1.68 magical acres at Maison 808 — the largest residential property to come on the market in the flats of Beverly Hills. Designed by Budd Holden and built in 1990, the stately 26,800-square-foot manor enchants with eight bedrooms, 15 bathrooms and gloriously detailed interiors that pay homage to classical symmetry and old world craftsmanship. A park-like setting envelopes two detached guesthouses, sculpted gardens and flat lawn, a lighted tennis court designed by tennis legend Jimmy Connors, a resort-style pool with waterslide and waterfalls, as well as a meandering miniature railroad inspired by Walt Disney’s legendary backyard on Carolwood Drive. Maison 808 is a world truly unto its own — a place that has welcomed prime ministers and presidents into its dignified embrace over the course of its 28-year history.